Recently I decided to drink a cup of Green Tea. The teabags had been sitting in my kitchen for a year. I gave the tea a try because I kept reading about the benefits this tea has. It has been known to help fight the growth of cancer cells, helps reduce cholesterol, specifically raising your good cholesterol (HDL) and lowing levels of your bad cholesterol (LDL), and it helps with dieting (it helps burn more calories). With the whole dieting thing, I was a bit skeptical. However, I read that part of the "help" comes from the caffeine that the tea provides. It contains less caffeine than coffee, but enough to keep you going. I don't like coffee, but sometimes I just need a kick in the rear end to get me going. So, I tried the tea that had been left neglected for a year. I was pleasantly surprised by a couple things. I love the taste. I don't have to add any sugar or sweetener because it is naturally sweet. It also gives me a refreshed feeling in the morning, and a relaxed feeling at night (when drinking the decaf version). Aside from giving me a energy boost, it also fills me up when I drink it with a meal. That is because I am drinking more liquid with a meal. The bottom line? 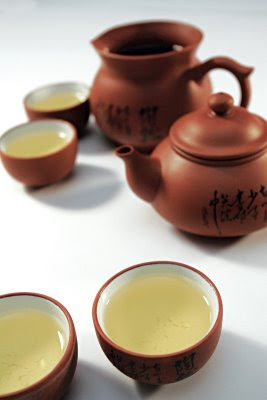 Those who haven't tried a cup of green tea, should...it is too sweet of a deal to pass up! By the way, there are a lot more benefits than I listed. To read about them, click here. The photos below were some of the photos that prompted me to join weight watchers. I could belive how horrible I looked. 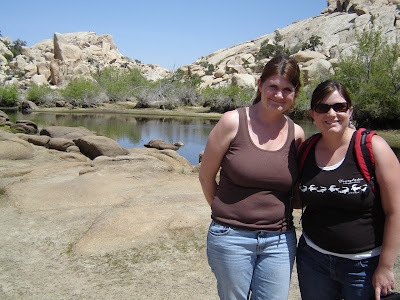 The photo was taken in Joshua Tree during a camping trip we took at the end of April. The photos following it were taken this past weekend, 20 lbs later (20.6 lbs to be exact)! I am down to 156.0 lbs! It is coming off slowly, but surely! Wow! 20 lbs sure does make a difference!